11th Edition of the Annual Journal of ENT Masterclass published. Pre- conference Workshop on LASERS & Hands-On Training Course in Laryngotracheal Reconstruction at PGIMER, Chandigarh. 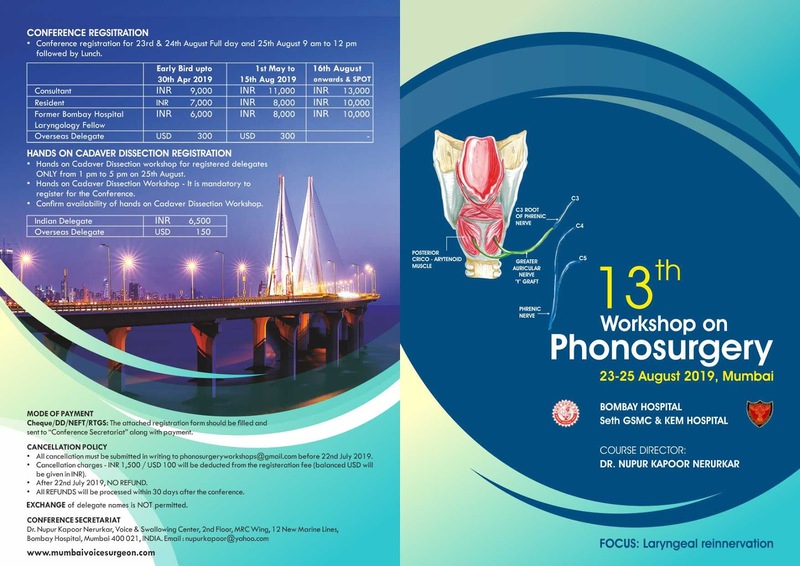 We are pleased to announce Pre- conference Workshop on LASERS & Hands-On Training Course in Laryngotracheal Reconstruction at PGIMER, Chandigarh. Delegates willing to attend ISSACON 2019, 29th -31st March 2019 can now register at INR 5,990! Observers can pay only INR 2000 for both the sessions! 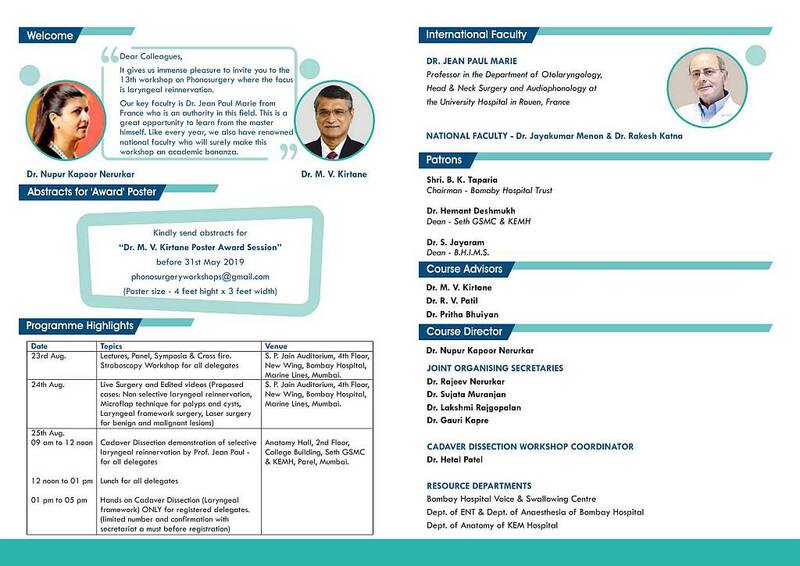 We request the pleasure of your participation in the Workshop on “Voice & Laser” being organised by the Department of ENT and Head & Neck Surgery, BLK Super Speciality Hospital, Pusa Road, New Delhi on 6th April 2019. We are humbled and as well as inspired by your support and the demand and therefore we have decided to conduct such courses on more regular basis. 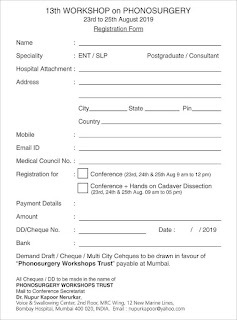 We are organizing our Next Hands on Temporal Bone Dissection course on 3rd & 4th August-2019. 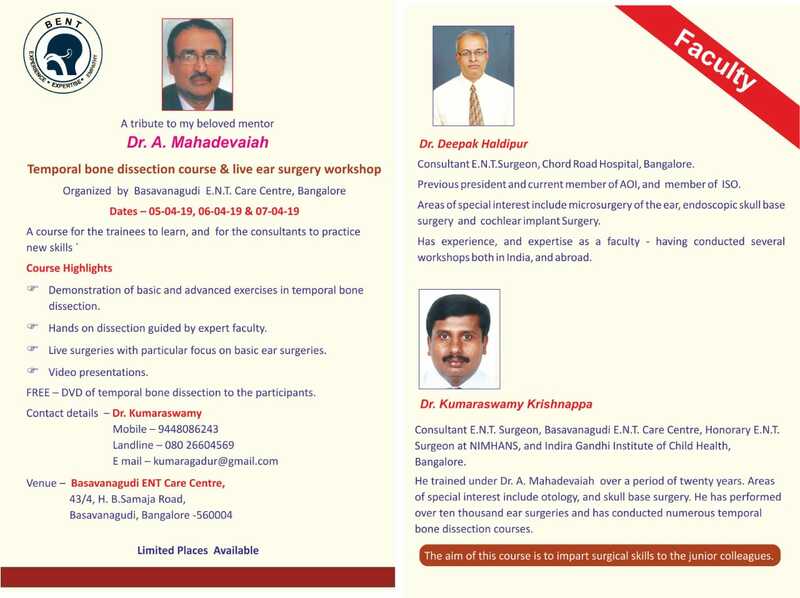 This Includes Temporal Bone Dissection demonstration by eminent faculty and Followed by dissection by the candidates. 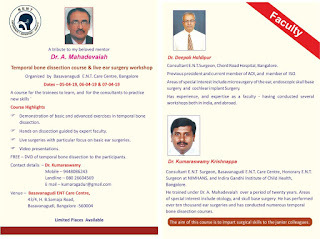 It gives me great pleasure to invite you to our 6th annual event ’11 Days of Facial Plastic Surgery’. This year’s edition will be held in conjunction with the ASEAN ORL-HNS Congress 2019. The event will include 2 consecutive fresh frozen cadaveric dissection courses, to be held from 26 August–1 September 2019. The upcoming courses have been enhanced further by incorporating the feedback from the participants and faculty from the previous courses. The scientific program has been designed to provide structured and methodical training covering a broad breadth of topics in Facial Plastic and Reconstructive Surgery. 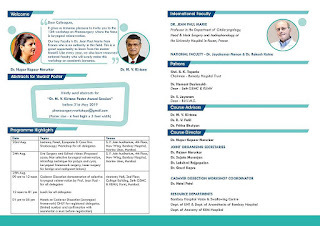 These rigorous courses offer an excellent hands-on opportunity for Otolaryngology, Plastic Surgery, Ophthalmology and Maxillofacial Surgery Residents, Fellows and Consultants to expand their knowledge and surgical skills in this fascinating area of surgical practice. The series of courses offer 4 days of dissection on high quality fresh frozen cadavers in a well-equipped surgical skills laboratory. State of the art surgical instruments, endoscopes, monitors and implants will be made available to the delegates. Participants in the previous courses have been very appreciative of the ample time available for dissection under close supervision of our learned international and national faculty that allowed them to learn a wide variety of surgical procedures at a comfortable pace. The participants will also benefit from the wealth of experience offered by our outstanding international and national faculty. We are fortunate to have internationally renowned Facial Plastic Surgeon Prof Peter A. Adamson as one of the Teachers of Honour for the courses. More faculty be confirmed very soon. Singapore is a lively city with many historical and modern architectural landmarks. It is a paradise for foodies and offers an abundance of experiences that will help you to have a memorable and enjoyable visit. Travel to Singapore is easy as it is well connected to major airports in the world. 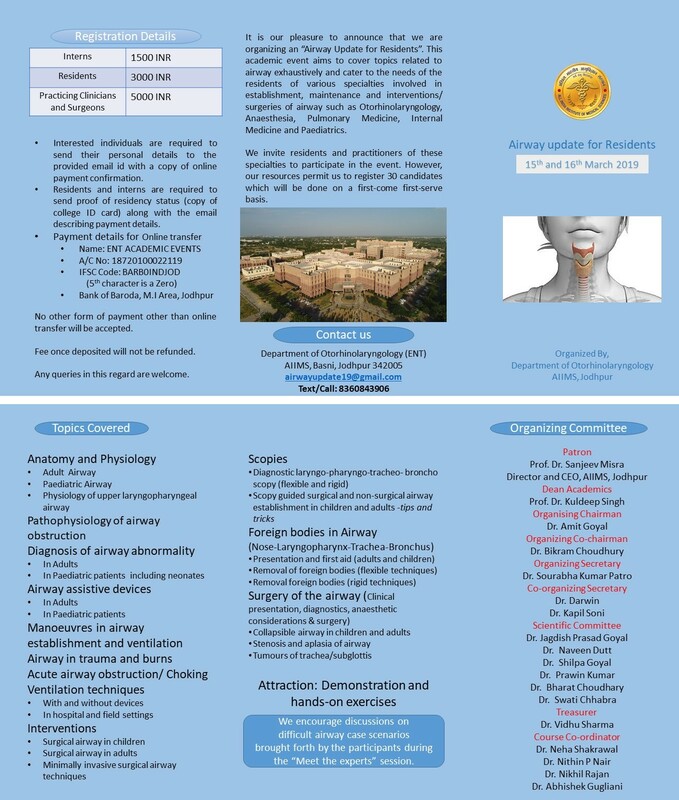 "AIIMS Airway update for Residents-2019 being organized by the Department of Otorhinolaryngology and Head and Neck Surgery, AIIMS, Jodhpur on 15th and 16th March 2019 at AIIMS, Jodhpur. 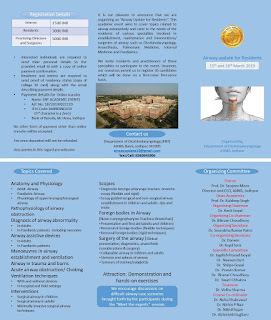 This academic event aims to cover topics related to airway exhaustively and cater to the needs of the residents of various specialties involved in establishment, maintenance and interventions/ surgeries of airway such as Otorhinolaryngology, Anesthesia, Pulmonary Medicine, Internal Medicine and Paediatrics. Interested individuals are required to send their personal details to the provided email id with a copy of online payment confirmation. Residents and interns are required to send proof of residency status (copy of college ID card) along with the email describing payment details. No other form of payment other than online transfer will be accepted. Fee once deposited will not be refunded. Any queries in this regard are welcome. We invite residents and practitioners of these specialties to participate in the event. However, our resources permit us to register 30 candidates which will be done on a first-come first-serve basis. We would be grateful and appreciate your support in circulating the information about the workshop. 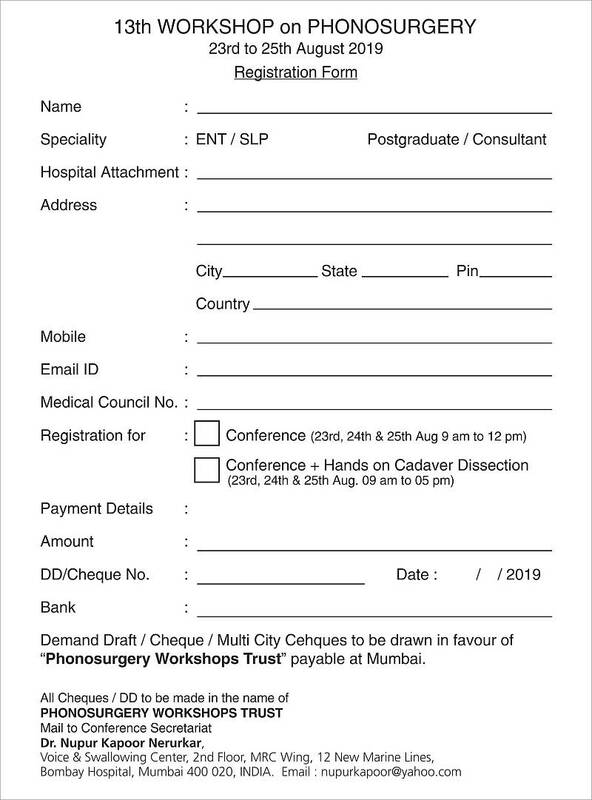 We request the pleasure of your participation in the AOIBBCON2019 (5TH Smart ENT) and an International Update in Laryngotracheal surgery being organized by the Department of Otorhinolaryngology and Head and Neck Surgery, IMS &SUM Hospital on 15th,16th and 17th March 2019 at IMS&SUM Hospital on behalf of Association of Otolaryngologists of India, Bhubaneswar Branch. Venue-Conference Hall, IMS & SUM Hospital, Siksha ‘O’ Anusandhan Deemed to be University, Kalinga Nagar, Bhubaneswar-751003, Odisha. Faculty - Dr Deepak Mehta(USA), Dr. Shyan Vijayasekharan (Australia), Dr. Hayley Herbert(Australia), Dr. EV Raman(Bangalore), Dr. Dev Roy(Kolkata). Demand draft should be in favor of Association of Otolaryngologist of India, Bhubaneswar branch, A/C No.-054100101011168.IFSC Code-CORP0000541. Accommodation will be arranged after telephonic confirmation.